Kyle will join an army of patriots walking to raise awareness and donations for PTSD and veterans’ suicide at the annual 92 for 22 benefit walk on Saturday September 22 in Grand Rapids, MI. 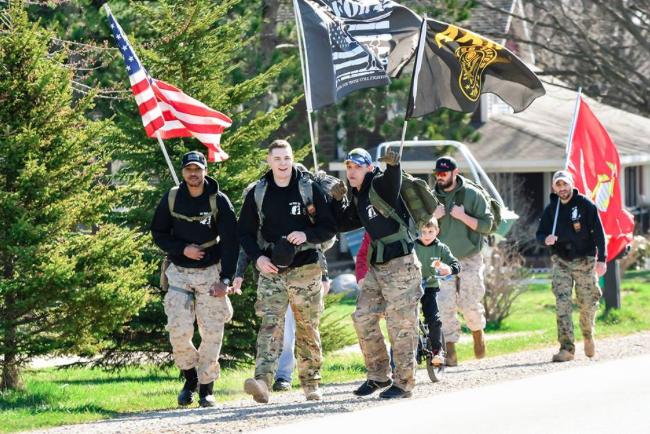 The walk is slated to begin at the Family Fare in Allendale, MI and will end at the Brann’s Steakhouse on Leonard St. in Grand Rapids for a total distance of 13 miles (22k), representing the 22 veterans who commit suicide everyday. Participants are encouraged to wear patriotic attire and carry flags, signs, and symbols to show their support and help bring attention to the cause. At the end of the walk there will be a gathering for dinner and a special acoustic performance by Kyle. The event is open to the public. Registration is $22 and comes with an official T-shirt. Previous post Kyle celebrates the release of his new single, “Chose To Be a Man”!